Magnificent DaVinci-based contraptions combine with frolicking feline fun to create an inspired puzzler voiced by Patrick Stewart! 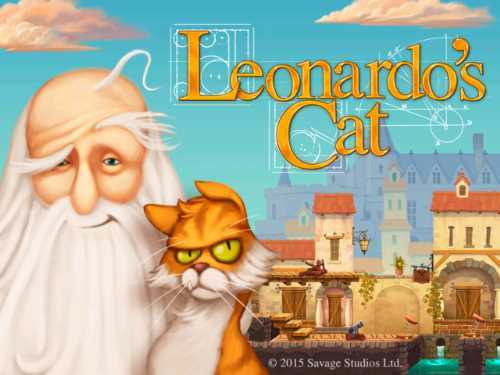 In Leonardo's Cat, revered actor Sir Patrick Stewart (Star Trek, X-Men) teams up with renowned puppet animator Michael Frith (The Muppets, Fraggle Rock) and writer Bob Tedeschi (NYTimes, Bobo Explores Light app) to create a learning romp filled with logic puzzles. Stewart voices Leonardo DaVinci's character as he talks the player through how to help his cat Scungilli navigate the obstacle-filled streets and buildings in 16th Century Amboise, France. In this modified-history game, rival Michelangelo steals Leonardo's robotic invention called the Automaton and then scatters its parts in six locations around Amboise. Leonardo sends his cat Scungilli to retrieve the missing pieces. The player helps Scungilli by placing Leonardo's inventions at critical places along the cat's route so that the feline can reach the required part. Each of the 60 puzzles starts with a Renaissance landscape filled with obstacles such as water hazards, brick walls, and a bed of glowing embers. 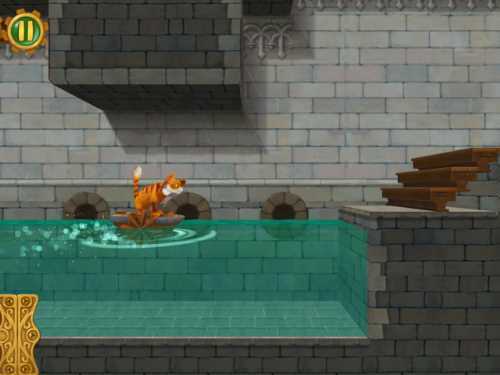 On the far left of the scrollable scene, Leonardo's cat awaits the start of his side-scrolling romp through the puzzle. But before you hit the "go" button to start him running to the right, you need to drag contraptions from the tray at the bottom to the yellow boxes scattered along the path. 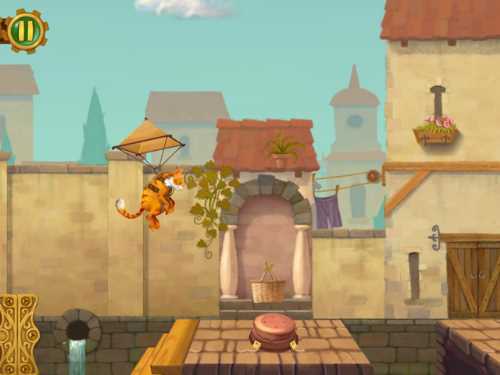 You can position a spring to help the cat leap over small expanses, shoot a canon to knock out path-blocking crates, and even strap wings to Scungilli so that he can fly over the trickier obstacles. 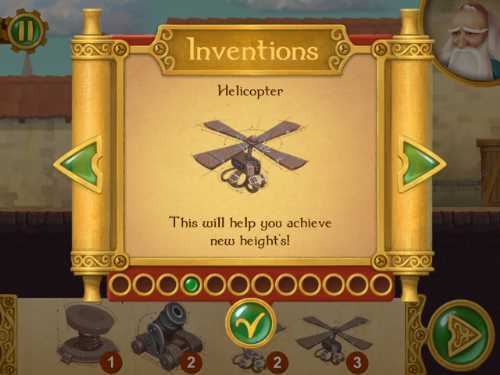 You eventually unlock 12 contraptions to use, many of which are based on Leonardo's drawings. Some, like the Teleporter, are pure fantasy! These Brain-teasers are the Cat's Meow! The puzzles, lightly dusted with science, involve thinking about how to best use the limited contraptions available to you. Some of the learning comes from trajectory jiggering ala Angry Birds since many of the inventions can be adjusted to fling or fly the cat in different directions. 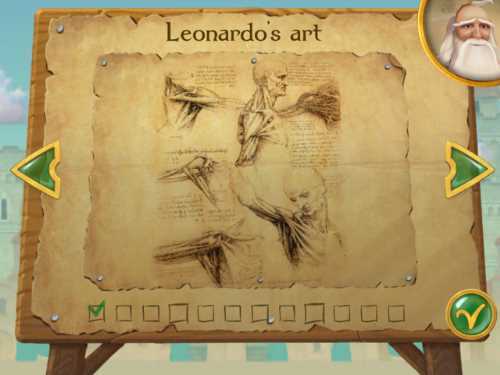 Also contributing to the player's knowledge is the ability to explore DaVinci's real drawings at the end of the app, while listening to him explain what they are. While Scungilli experiences some cat abuse (drowning, electrocution by lightning, smacking into things), it's depicted in a cartoony manner. And luckily, this cat has more than nine lives; so after a failure, players find a healthy Scungilli waiting at the beginning, ready to try again. Players can tweak their solution and try again -- repeatedly. 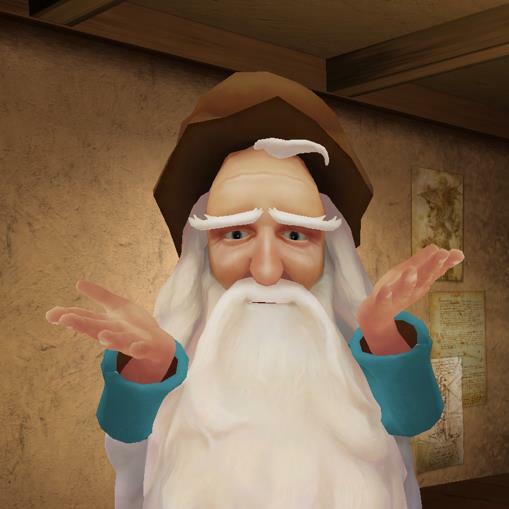 The animation of Scungilli adds to the player's fun. He meows and caterwauls, just like a real cat. When he drops from a height, he paws the air in typical feline behavior as he falls. Another contributor to this app's convivial atmosphere is the upbeat background music that has a renaissance fair-like feel. These inventions are so much fun to play with that kids would relish the opportunity to use them to create their own puzzles. Perhaps the developer will add a Create-Your-Own Puzzle mode in the future. Leonardo's Cat presents logic puzzles the whole family will enjoy. The puzzles do get increasingly more difficult, and don't come with hints. This setup requires players to experiment with solutions, debug and to sometimes throw out their first solution and come at it from a different direction (the puzzles frequently present more than one pathway through). By exploring these puzzles with another player, younger puzzlers might experience less frustration. The reward of solving a puzzle -- watching Scungilli scramble through your solution -- creates a thrill, similar to watching a well-designed Rube-Goldberg machine operate. Fans of Patrick Stewart will also get a kick out of Leonardo's Cat because Stewart's performance is masterful! With the witty humor throughout, these brain busters have cross-generational appeal. Check out our VIDEO REVIEW of Leonardo's Cat by clicking here. This Leonardo's Cat app review was written by Jinny Gudmundsen.